Fri., Aug. 17, 2018, 5:55 a.m.
Spokane 3, Everett 2: Curtis Terry hit a two-run home run to push his league-leading total to 15 and the Indians (12-9) beat the visiting AquaSox (10-11). Terry went 1 for 2 with two walks, started a nifty 3-6-3 double play, and even stole a base – his first of the season and fifth in his career. Starter Ryan Dease went four innings and allowed two runs on seven hits and two walks with two strikeouts. Reliever Brett Eibner picked up his first win with two shutout innings and Emmanuel Clase pitched a scoreless ninth for his ninth save. J.P. Martinez (3): 3 for 5, run. Tri-City 6, Vancouver 0: Tucupita Marcano went 3 for 4 with a homer and three runs and the visiting Dust Devils (8-13) beat the Canadians (13-8). T-C starter Omar Cruz struck out five over four innings, but walked four. Nick Kuzia got the save with three one-hit innings. 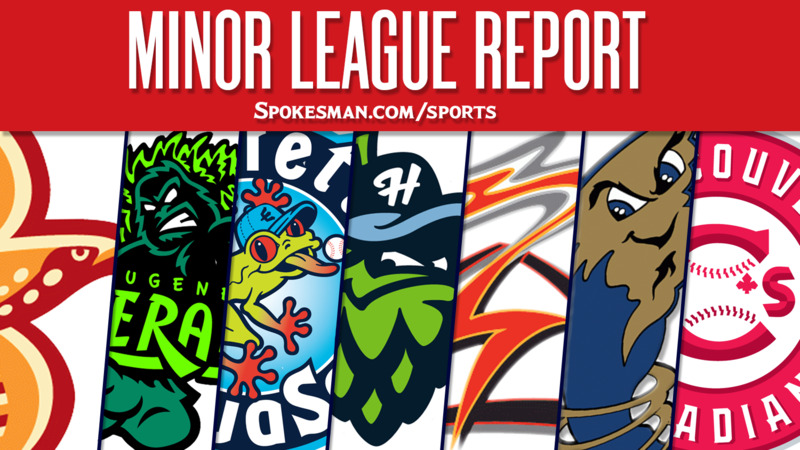 Salem-Keizer 7, Boise 4: Nick Hill launched a two-run insurance homer in the eighth inning and the visiting Volcanoes (11-10) defeated the Hawks (7-14). Kyle McPherson went 2 for 5 with a run and two RBIs for S-K.
Eugene 2, Hillsboro 1: Paul Richan struck out five over four perfect innings and the Emeralds (10-11) edged the visiting Hops (13-8). D.J. Artis and Luis Vazquez drove in runs for Eugene. Round Rock (AAA) 3, Nashville 2: Nick Noonan went 2 for 4 with a two-run triple and the visiting Express (55-68) edged the Sounds (66-57). Drew Robinson doubled Noonan home to complete a three-run seventh. Adrian Sampson struck out six over 5.2 innings. Arkansas 7, Frisco (AA) 5: Seattle Mariners top prospect Kyle Lewis drove in three and the visiting Travelers (63-59) beat the RoughRiders (52-71). Jonathan Hernandez allowed two runs on six hits and two walks with four strikeouts for Frisco. Michael O’Neill homers for the RoughRiders. Carolina 2, Down East (High-A) 1 : Weston Wilson drove in two and the visiting Mudcats (58-63) beat the Wood Ducks (52-71). Rollie Lacy struck out six over seven innings and allowed one hit and two walks. Hickory (Low-A): A.J. Alexy struck out eight over 4.2 innings and the visiting Crawdads (62-59) blanked the Tourists (54-66). Alexy allowed two hits and three walks. Bubba Thompson homered and Yohel Pozo went 2 for 3 with two RBIs. Published: Aug. 17, 2018, 5:55 a.m.